200 W. 12th Bill Mack St. I have a screen printing business where I will be making tee shirts, bags and poster art, based around Route 66. I also am helping manage my Parent's campground, West 40 RV Park, along Rt 66 just West of Shamrock, TX, we sell Rt 66 themed items there also. 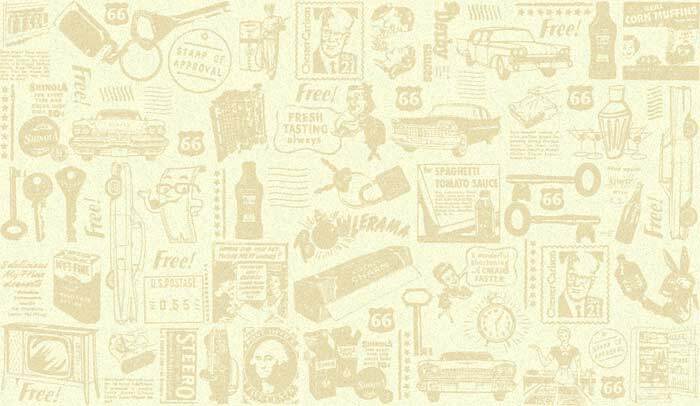 Route 66 Memorabilia, some exclusive to this store only. Two fine artists producing their Route 66 items with their art (key chains to limited prints). A large vintage coture area, patio, candles and antiques. Voted Amarillo's best hotel ten consecutive years, the Ambassador Hotel is the embodiment of Texas Hospitality. Superior accommodations, extraordinary service and hospitality without equal make the Ambassador the choice for luxury accommodations in Amarillo. Audrey Belle's "The Girl Store"
Art Gallery which includes Paintings, Sculpture & Photography. This is a website business. I design and manufacture 3 inch x 2 inch Fridge Magnets, Zipper Pulls, Route 66 Drivers License, Photo Bookmarks, Jewelry, Photo keychains. This is 5,000+ sq. ft. of heated and cooled antiques with approximately 50 dealers and opened 7 days a week no matter the weather. We do close 3 days a year. We do not carry new, reproductions, crafts. We try to stay true to classic, vintage and antiques. Antiques, Glassware, Retro & Art Deco Furniture, locally made steel Route 66 signs, steel silhouette cars and trucks. Located in a vintage 1920's home on Route 66 in Amarillo, Texas. The Art of Walter Wolfram, Jr.
We will be selling anything you can think of to decorate both old and new. We will specialize in Antique Furniture, and also accent items to match any decor. We will also have a large selection of Fenton Art Glass, and costume jewelry. If we don't have something you are looking for I guarantee you'll find something you weren't, but can't go home without! Under reconstruction, should reopen by January 2012. Uncommon Twists Garden Center Inc.
Libby's Old Route 66 Restaurant, Gifts, Etc. Vintage cafe and gift shop that specializes in Route 66 souvenirs and the only place along RT 66 where you can purchase "Midpoint" souvenirs. Also American style vintage cafe (can we ay 50's) that is world famous for it homemade pies and all fresh, never frozen angus burgers and our old-style fried bologna sandwiches. 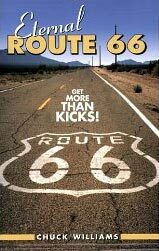 We sell our book, Eternal Route 66. Increase exposure and grow your business! If you already have a basic listing in the directory, upgrade to a free enhanced listing here. Click here for a sample enhanced listing. If there is any information that you do not want published, just leave that field blank. Email address is the only required field. Is there an image of your business online that you would like used in your directory listing? If so please enter url (web address). To get the url, you can right or alt click on the image and select "Copy Image Location" and paste that in this box. The image can be representative of the products you sell, or an image of the business itself. Would you like to recieve our e-newsletter with helpful articles and news?